Universities cannot be passive accomplices in grave human rights violations. The State of Israel maintains an illegal occupation, colonization and apartheid regime against the Palestinian people, and the Israeli Embassy is this regime’s representative in Chile. In addition, the Israel Antiquities Authority is a government entity illegally based in occupied East Jerusalem that carries out illegal excavations in the occupied Palestinian West Bank. Some of these illegal excavations are directed by the invited speaker, Joe Uziel. The confiscation and theft of Palestinian cultural heritage are part of Israel’s attempts to erase Palestinian memory and cultural identity. Since 1967, the IAA has been deeply involved in cultural crimes and serious violations of international law, such as illegally removing and plundering hundreds of thousands of precious artifacts from the Occupied Palestinian Territory (OPT), including East Jerusalem. Fearing BDS campaigns, Israel has been trying to prevent information about archeological work in the OPT from being made public and to whitewash these violations by promoting events like these abroad. Through the Israel Antiquities Authority, Israel attempts to bury the history of the indigenous people of Palestine, which was always home to groups with diverse cultures and religions. This is an extension of Israel’s policies of expulsion and cultural theft that it has carried out against Palestinians since its establishment. Israel has a troubling record of systematically looting Palestinian lands and properties, cultural treasures and even books and artworks, which continues until today. We salute the Chilean students for pressuring the Anthropology Department of Alberto Hurtado University and the Social Sciences Faculty of University of Chile to take principled positions. Academic institutions should not lend their good names to Israel’s denial of Palestinian rights. 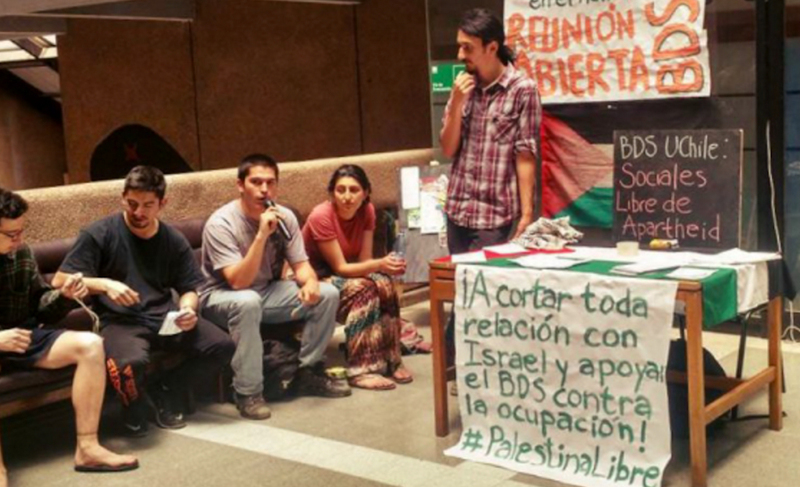 We hope to see all Chilean universities fully free of Israeli apartheid. We welcome the decisions of Alberto Hurtado University and the University of Chile. The Palestinian people expect principled acts of solidarity in support of their human rights and the respect of international law. These cancellations demonstrate Chilean students’ determination to denounce Israel’s oppression and to work towards interrupting our universities’ ties with institutions complicit in Israeli apartheid. This latest news is another stride in the growing academic boycott of Israel in Chile. Last year, law faculty students at the University of Chile overwhelmingly voted in support of BDS, as did more than 90% of the social sciences students. At the Catholic University of Chile, the Student Council also passed a BDS resolution by a large majority. The cancellations are also another strike against the Israel Antiquities Authority. At the end of 2016, the 8th World Archaeological Congress published a resolution condemning Israel’s excavations in the Occupied Palestinian Territory and called on international academic publishers to refuse publishing works related to archaeological research in those areas.